Buy Now Amazon - Buy Now! Amazon - Buy Now! Amazon - Buy Now! Amazon - Buy Now! Amazon - Buy Now! Easily Portable Yes No No No Yes! The topic of sleeping is a touchy one in the baby world today because of increasing research related to SIDS and what is now considered safe sleeping practice. That’s why it’s important to do some great research before investing in a baby bassinet that will best suit your needs. With endless options to choose from with various features and target markets, there’s a baby bassinet that is sure to fit your family and baby well. Here we’ve reviewed some of our favorite baby bassinets and co-sleepers to help make the searching a little easier for you. If you’re looking for the safest and most high-quality bassinet on the market, you’ve found one in the BabyBjorn Cradle. BabyBjorn has consistently produced quality, safe, and high-end baby products and the Cradle is no different. The compact and light design means this bassinet is perfect for tight spaces and easy maneuverability throughout the home. In addition to the safe materials that pass some of the strictest safety standards in Europe, the BabyBjorn Cradle is has a safe design with no bars or loose parts for cute little limbs to get trapped in. The surrounding mesh sides create great airflow and breathability and allow for easy viewing of baby. In the end, the BabyBjorn Cradle is one of the best bassinets on the market. The BabyBjorn MSRP is $350, but check the current BabyBjorn Cradle – Amazon price. In the end, if you’re looking for the highest quality baby bassinet, you can’t go wrong with the BabyBjorn Cradle. Read the full review for the BabyBjorn Cradle. 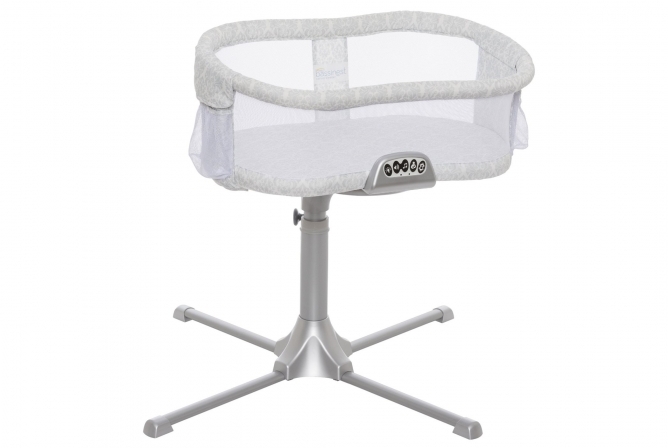 This high-end bassinet has some great features that have the ability to make parent’s and baby’s life easier. With some great smart features (nightlight, 3 lullabies, 3 nature and womb sounds, 2 levels of vibration, and nursing timer with auto shut off) assist with night-time activities while still creating a soothing environment for everyone. Mesh walls and a moveable side wall maximize comfort and safety while making it easy to care for baby from bed. The greatest feature of the HALO Bassinest Swivel Sleeper is the 360-degree swivel capability. This allows mom and dad to get in and out of bed easily but also allows parents to bring baby right in bed while having a safe sleeping space. The swivel feature is awesome for C-section moms with limited mobility who might have a hard time getting in and out of bed or sitting up to care for their new babe. The MSRP on the HALO website is $249, click here to find the current HALO Bassinest Swivel Sleeper – Amazon price. In the end, the high price tag for the HALO Bassinest Swivel Sleeper pays for itself in convenience and safety. Read the full review for the HALO Bassinest Swivel Sleeper. The Arm’s Reach Clear-Vue Co-Sleeper is a great option for families that want to co-sleep safely, or for moms that have a difficult post-partum recovery. 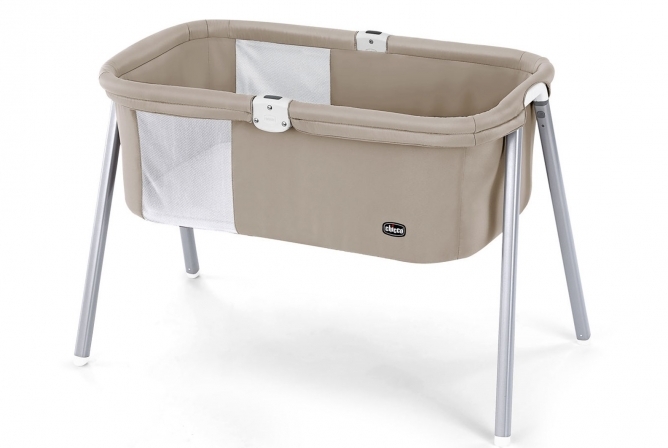 This bassinet can be used either by the bedside or as a freestanding bassinet as well. The bedside option makes it easy to tend to baby at night without getting out of bed multiple times. 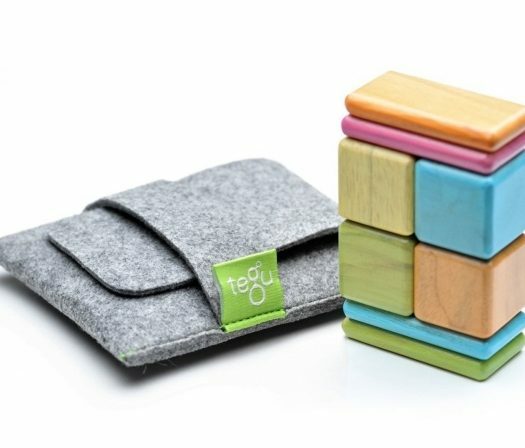 It also gives baby and parents the security of sleeping close. The Arm’s Reach Clear-Vue Co-Sleeper is an awesome multipurpose bassinet, making it a great option for any family and baby create sweet dreams in. MSRP for the Arm’s Reach is $150 but check out the Arm’s Reach Clear-Vue Co-Sleeper – Amazon price right now. With a sturdy and comfortable design for both baby and parent, the Arm’s Reach will provide an easy sleeping setup for any family. Read the full review for the Arm’s Reach Clear-Vue Co-Sleeper. When it comes to versatility, the Graco Dream Suite Bassinet – Mason has it mastered. 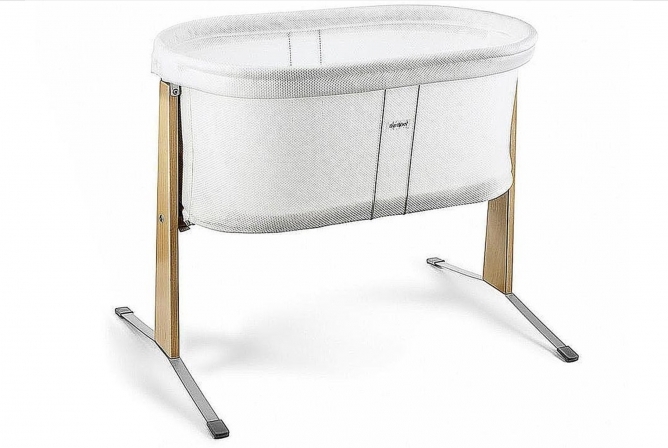 With this bundle, you not only get a cozy and entertaining bassinet but a changing table at the click of a button. Easy to wash fabrics, vibration settings, a canopy, soft toys, and a mattress pad cover are also included in this big bundle. And don’t forget the large storage basket that hangs out beneath the bassinet, perfect for diapers, wipes, burp cloths, and other necessities you might need handy. For added safety, there are also lockable wheels and mesh side panels in the sleeping area. All-in-all, the Graco Dream Suite Bassinet – Mason is a great versatile little bassinet that can provide long use and many different needs for your family. The MSRP is $150 but check the Graco Dream Suite Bassinet – Mason – Amazon price here. Read the full review for the Graco Dream Suite Bassinet – Mason. The Chicco Lullago Portable Bassinet is a great option for families that travel frequently, whether it be across the world or just over to ma and pa’s house frequently. The Lullago assembles or disassembles in less than a minute and is extremely easy to travel with. It could also be a great option for families with limit space that would like to stow away the bassinet when it’s not in use. Also included is a great little tote bag that all of the Lullago parts fit easily into for lugging around from place to place. All-in-all, the Lullago is a great option for many families who are looking for an easy to use, transportable bassinet on a tighter budget. With an MSRP of $100, check the Chicco Lullago Portable Bassinet – Amazon price here. Read the full review for the Chicco Lullago Portable Bassinet. Each bassinet serves a different purpose, so it’s a great idea to know what you are looking for before you start looking! Whether you are looking for a co-sleeper or would like a high-end bedside bassinet, as long as you invest in a sleeper that will keep your baby safe and sound while they create sweet dreams, these five products are great options to choose from. DISCLOSURE: We research each product thoroughly and give unbiased ratings of only the very best products, however we can only stay afloat through compensation we receive from our affiliate partners. Please see our full Affiliate Disclosure page for details. RE-PUBLISHING: Note that we sometimes update and/or re-publish articles from our archives that are informative or highly-relevant… like this one! Amanda is a working wife and momma of two feisty toddlers. She's a Cheesehead from Wisconsin that values family and aims to love others above all else. Amanda enjoys doing anything and everything outdoors (rain, snow, or sunshine) as well as reading, naptime, and building stuff. Just click on her name to check out all her BabyGearSpot posts! We’re all parents who have been there! This site started out of pure frustration of endless “Mommy Blogs” out there that gave you just one opinion of just one (well-meaning, but still innately biased) mom. We thought “we’d like to make our purchasing and parenting decisions based on PROFESSIONAL RESEARCH of multiple editorial sites and also as many as possible personal reviews”. We also happen to be writers, so we got to researching for ourselves and then wrote it all down for everyone else to share in our new-found-knowledge. So you get all the BENEFITS of PROFESSIONAL RESEARCHERS doing the legwork for you, but don’t have to do all the same Googling, interviewing and note-taking that we did!